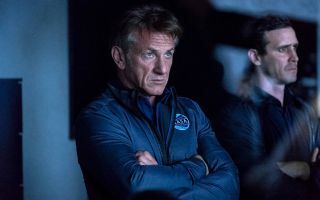 Sean Penn plays Commander Tom Hagerty, an older, experienced astronaut who hopes to lead the first team to Mars. He struggles immensely with the idea of leaving his family behind yet again, to explore space without the certainty of return. The show also highlights his troubling and heart-wrenching relationship with his daughter, Denise, played by Jacoby-Heron, who is fighting addiction. It's clear from the start that Hagerty is no Chris Hadfield. Penn's character is more than a bit rough around the edges, though, like a real astronaut, his public demeanor is professional despite his emotional distress. Laz Ingram, as played by Natascha McElhone, is a visionary aerospace magnate leading the crew of astronauts who hope to be the first to land on Mars in the new sci-fi series "The First." Ingram, along with the crew, contend with personal sacrifice and turmoil in the hopes of becoming the first on the Red Planet. In "The First," a near-future dramatic series starting Sean Penn, a brave crew of astronauts hopes to be the first to land on the Red Planet. Aside from the interpersonal, emotional aspect of space travel that the show explores, "The First" also gives viewers a glimpse into the bureaucracy of space. Laz Ingram, played by McElhone, leads the fictional private space agency that contracted with NASA for the Mars mission. Stern and almost strangely unemotional, Ingram at first seems to fulfill the "cold, impersonal" trope that is often written for female characters. But, as the show progresses, her true depth becomes apparent. As she works, Ingram faces backlash and red tape at every turn, dealing withbudget cuts, investigative journalists and tight deadlines. Through Ingram's character, in particular, the real-life pressure and volatility of space travel is on display in "The First."